Great news! There were some tense moments for awhile there, but we’re happy to report class is back in session at Greendale Community College. Well, at least it will be starting March 17th. That’s right, with most of the original cast once again cracking the books and getting to know each other better in the study room, Community is scheduled to return at its new home on Yahoo Screen. But don’t just take our word for it, see what the cast has to say about this monumental event in a new video. Check it out after the break. Six seasons and a movie! It’s a bit hard to believe that Community, NBC’s little comedy that could, is about to debut its fifth season. Because it started out so strong, and so different, from a lot of network comedies, we were almost positive it wouldn’t last this long. We were particularly concerned when creator and showrunner Dan Harmon was kicked off the show. But still, it kept on going and miraculously, NBC realized they had made a mistake in letting Harmon go and brought him back for season five. That brings us to now with the January return of Community just around the corner and we couldn’t be happier about it. Naturally, we’ve got a preview for you. Check it out after the break. Look for Community to return on Thursday, January 2 at 8 on NBC. We love Community. You love Community. It all makes sense. So, this gag reel from the last season of the show should be as entertaining to you as it was to us. Sure, things won’t be exactly the same without creator Dan Harmon working his magic on the show next season, but that doesn’t mean we can’t relive some great moments of the past season — especially if they’re in the form of a very funny gag reel. Who doesn’t love a good gag reel? See, actors are only human too. They mess up just like you and me. They’re just better looking when doing it. Check out the vid after the break. 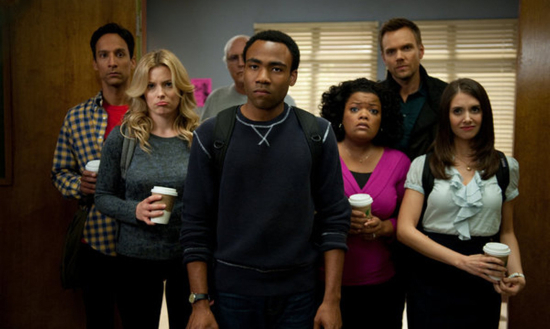 Community returns, full cast intact but minus Mr. Harmon, this Fall on NBC. Summer is finally coming to a close, and for most that means heading back to school or waking up early to take their little ones to school, but the good news is that all news shows are returning to the primetime lineup! Some people are excited for things like the brand new look of The Office or new comedies like Up All Night and Whitney to start, but we can tell you none of that compares to what we are looking forward to in the upcoming third season of NBC’s Community. Last season, we had things like an Apollo 13 spoof, another paintball tournament, and some amazing cameo guest stars, but from what we can tell in this new extended trailer for the season, that’s only the tip of the iceburg in what the students and staff at Greendale Community College have to offer. Check out the brand new teaser after the jump, featuring a peek at an incredibly austentacious-looking musical number, and some of the most intense dialogue performed by John Goodman since the final season of Roseanne after the jump and catch the season premiere of Community on September 22nd. By geek-Santa’s beard, this may be one of the best, marketable ideas ever created. For those who love NBC’s Community as much as we do, you’re going to love this batch of imaginary action figures made by our new super genius, online artist and animator Yehudi Mercado. The idea? Just your regular, run of the mill action figure mock-ups, except they are of our favorite Community characters (with the exception of Starburns and the Dean) done up in some classic season 1 and season 2 episode’s outfits. We don’t have much else to say, except that you should go to Yehudi’s site (cleverly titled ActionFigurology.com) and show him as much love as possible so we can get these figures made! Take a look at the full-sized images of each figure after the jump. Who doesn’t love a classic stop-motion Christmas special around the time of the holidays? Rankin/Bass productions like Rudolph The Red-Nosed Reindeer have pulled families together for generations around this time of year, and now it’s time for NBC’s breakout comedy Community to do the same. Next Thursday, the gang is going a little bit clay, as they get transformed into a world of claymation, thanks to the Dino Stamatolpoulus’ (Star-Burns) stop-motion studio. Here’s the episode’s official synopsis. When Abed wakes up in stop-motion animation, he takes it as a sign that he and the group must re-discover the meaning of Christmas. Meanwhile, Jeff and Britta become growingly concerned about Abed’s mental health and enlist the help of Professor Duncan. The group undergoes hypnosis to explore Abed’s winter wonderland and soon unravel the truth behind Abed’s madness. Series stars Danny Pudi and Allison Brie got to go behind the magic at the stop-motion studio and check out how things were going. Check out parts one and two of their all-access tour and be sure to catch “Abed’s Uncontrollable Christmas” Thursday, December 9th, on NBC.